rainbow1, txacar, lizcarlo and 2 others like this. I am happy that she gets two songs. It seems like Carrie is the go to woman when it comes to specials like this. Do we know if this is the performance order???? I’m actually quite excited to see her sing with artists she doesn’t get the opportunity to collaborate with rich as: Shawn Mebdes, Post Malone, Yolanda Adams, and even Blake Shelton. txacar, DaisyTweets, rainbow1 and 1 others like this. Thanks, D!!! I'm hoping its the performance order so I can time it to see & hear as little of Mr. BS himself!!!! I have better things to do (like watch paint dry)than to listen to that pompous jerk!!!! 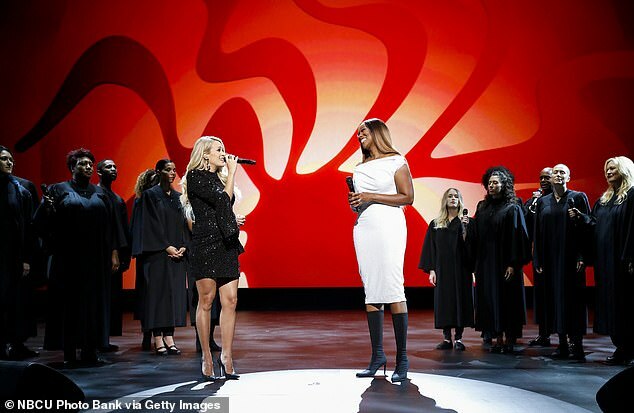 I like Kelsea, and am glad she got a performance slot in this tribute - but I have to admit that I'm a little disappointed that Carrie didn't get "Always On My Mind", as her version of this song, with Willie Nelson, was such a good one, catching the subtle tone variations that Willie has made his trademark. txacar, Suellen, liz278 and 8 others like this. I do remember -- she was in the famous studio (can't remember the name). We never heard details so it's possible she was there to record for this. Here is info I saw yesterday regarding the album (tweeted by Sony Legacy). "As a whole host of stars prepare to honour The King in the ‘Elvis All-Star Tribute’ airing Sunday, February 17 on NBC we’re proud to announce the companion album; ‘The Best Of The ’68 Comeback Special’, released February 15. 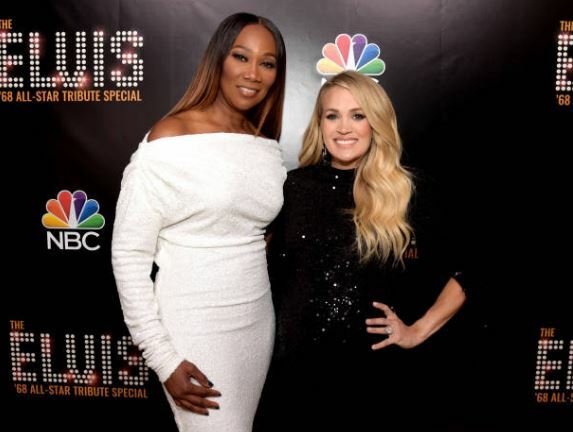 An astonishing companion piece to the exclusive NBC broadcast, ‘The Best Of The ’68 Comeback Special’ features Elvis’ original vocals alongside new performances by Carrie Underwood, Shawn Mendes, Post Malone, Darius Rucker and Blake Shelton on a very special version of ‘If I Can Dream’." Smokyiiis, ethelu, liz278 and 3 others like this. I suppose it is possible, but I guess I was under the impression that this album was recorded live? Totally my own assumption, though. I haven't actually read that anywhere. maddkat, txacar, DaisyTweets and 2 others like this. abbeyjones18, txacar, Smokyiiis and 8 others like this. So cute! Love that photo! txacar, rainbow1 and oldyfan like this. DaisyTweets, Smokyiiis, MSCarriefan and 8 others like this. Bet the first picture is her while she's singing HGTA!!!! Last edited by DaisyTweets; 01-17-2019 at 05:55 AM. maddkat, Smokyiiis, MSCarriefan and 3 others like this. Ok call me crazy but just seeing those pictures, especially the first one, just gives me goose bumps!!!! rainbow1, txacar, kdprouty and 1 others like this. As a huge Shawn Mendes fan, there are no words to express how excited I am to see and hear Carrie singing with him. I wish cross-genre collabs were more popular than they are. Shawn's CMT Crossroads special with Zac Brown Band was phenomenal. teesharky, txacar and rainbow1 like this. Haga ne too. I cannot wait for this! txacar, rainbow1, lizcarlo and 1 others like this. some tweets he has posted etc. I think this will be great. txacar, rainbow1, ethelu and 2 others like this. @NBC will air the #ElvisAllStarTribute on Sunday, February 17th from 9-11 p.m. ET/PT, and I'll be performing with #CarrieUnderwood!! Loretta Lynn to celebrate 50th Opry Anniversary Is Carrie going to be involved in it?